The Simons Foundation has given $38.4 million to establish a new astronomy facility in Chile’s Atacama Desert, adding new telescopes and detectors alongside existing instruments in order to boost ongoing studies of the evolution of the universe, from its earliest moments to today. The Heising-Simons Foundation is providing an additional $1.7 million for the project. The Simons Observatory is a collaboration among the U.S. Department of Energy’s Lawrence Berkeley National Laboratory (Berkeley Lab); UC Berkeley; Princeton University; the University of California at San Diego; and University of Pennsylvania, all of which are also providing financial support. The observatory will probe the subtle properties of the universe’s first light, known as cosmic microwave background (CMB) radiation. The observatory will pay particular attention to the polarization, or directional information, in the CMB light to better understand what took place a fraction of a second after the Big Bang. While these events are hidden from view behind the glare of the microwave radiation, the disturbances they caused in the fabric of space-time affected the microwave’s polarization, and scientists hope to work backwards from these measurements to test theories about how the universe came into existence. “The Simons Observatory will allow us to peer behind the dust in our galaxy and search for a true signal from the Big Bang,” said Adrian Lee, a physicist at Berkeley Lab, a UC Berkeley physics professor and one of the lead investigators at the observatory. A key goal of the project is to detect gravitational waves generated by cosmic inflation, an extraordinarily rapid expansion of space that, according to the most popular cosmological theory, took place in an instant after the Big Bang. 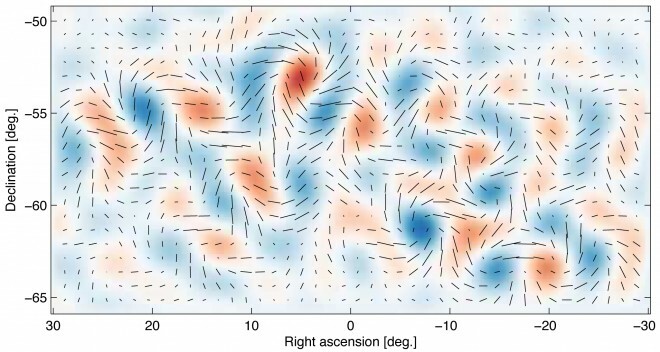 These primordial gravitational waves induced a very small but characteristic polarization pattern, called B-mode polarization, in the microwave background radiation that can be detected by telescopes and cameras like those planned for the Simons Observatory. Lee added, “Once we see the signal of inflation, it will be the beginning of a whole new era of cosmology.” We will then be looking at a time when the energy scale in the universe was a trillion times higher than the energy accessible in any particle accelerator on Earth. By measuring how radiation from the early universe changed as it traveled through space to Earth, the observatory also will teach us about the nature of dark energy and dark matter, the properties of neutrinos and how large-scale structure formed as the universe expanded and evolved. Two existing instruments at the site—the Atacama Cosmology Telescope and the Simons Array—are currently measuring this polarization. The foundation funds will merge these two experiments, expand the search and develop new technology for a fourth-stage, next-generation project—dubbed CMB-Stage 4 or CMB-S4—that could conceivably mine all the cosmological information in the cosmic microwave background fluctuations possible from a ground-based observatory. LBL The Simons Array in the Atacama in Chile, with the Atacama Cosmology Telescope, on Cerro Toco in the Atacama Desert in the north of Chile, near the Llano de Chajnantor Observatory. The Simons Observatory is designed to be a first step toward CMB-S4. This next-generation experiment builds on years of support from the National Science Foundation (NSF), and the Department of Energy (DOE) Office of Science has announced its intent to participate in CMB-S4, following the recommendation by its particle physics project prioritization panel. Such a project is envisioned to have telescopes at multiple sites and draw together a broad community of experts from the U.S. and abroad. The Atacama site in Chile has already been identified as an excellent location for CMB-S4, and the Simons Foundation funding will help develop it for that role. Experiments at the Chilean site have already paved the way for CMB-S4. A 2012 UC Berkeley-led experiment with participation by Berkeley Lab researchers, called POLARBEAR, used a 3.5-meter telescope at the Chilean site to measure the gravitational-lensing-generated B-mode polarization of the cosmic microwave background radiation. The POLARBEAR experiment is mounted on the Huan Tran Telescope (HTT) at the James Ax Observatory in the Chajnantor Science Reserve. Team scientists confirmed in 2014 that the signal was strong enough to allow them eventually to measure the neutrino mass and the evolution of dark energy. The recent addition of two more telescopes upgrades POLARBEAR to the Simons Array, which will speed up the mapping of the CMB and improve sky and frequency coverage. The $40 million in new funding will make possible the successor to the Simons Array and the nearby Atacama Cosmology Telescope. Current stage-3 experiments for these short-wavelength microwaves, which must be chilled to three-tenths of a degree Kelvin above absolute zero, have about 10,000 pixels, Lee said. Berkeley Lab and UC Berkeley will contribute $1.25 million in matching funds to the project over the next five years. The $1.7 million contributed by the Heising-Simons Foundation will be devoted to supporting research at Berkeley to improve the microwave detectors and to develop fabrication methods that are more efficient and cheaper, with the goal of boosting the number of detectors in CMB experiments by more than a factor of a 10. The site in Chile is located in the Parque Astronómico, which is administered by the Comisión Nacional de Investigación Científica y Tecnológica (CONICYT). Since 1998, U.S. investigators and the NSF have worked with Chilean scientists, the University of Chile, and CONICYT to locate multiple projects at this high, dry site to study the CMB. The project manager for the Simons Observatory will be located at Princeton, and Princeton faculty also will oversee the development, design, testing and manufacture of many of the observatory’s camera components. A critical element in wringing new cosmological information from the CMB — which is the glow of heat left over from the Big Bang — is the use of densely packed, very sensitive cryogenic detectors. Princeton’s expertise with the detector development for the Atacama Cosmology Telescope in Chile and other observatories will complement the collaborative effort of the Simons Observatory, said Suzanne Staggs, Princeton’s project lead for the observatory and the Henry DeWolf Smyth Professor of Physics. Of particular importance is the University’s large dilution refrigerator-based camera testing facility located in the Department of Physics. The CMB has a temperature of 3 degrees Kelvin (-454.27 degrees Fahrenheit), and CMB detectors are more sensitive the colder they are. The Princeton facility will test the Simons Observatory equipment at a frosty 80 millikelvin, or eighty one-thousandths of a degree above absolute zero. The Simons Observatory is designed to be a first step toward CMB-S4. This next-generation experiment builds on years of support from the National Science Foundation (NSF), and the Department of Energy (DOE) Office of Science has announced its intent to participate in CMB-S4, following the recommendation by its particle physics project prioritization panel [FNAL P5]. Such a project is envisioned to have telescopes at multiple sites and draw together a broad community of experts from the U.S. and abroad. The Atacama site in Chile has already been identified as an excellent location for CMB-S4, and the Simons Foundation funding will help develop it for that role. POLARBEAR McGill Telescope located in the Atacama Desert of northern Chile in the Antofagasta Region. The POLARBEAR experiment is mounted on the Huan Tran Telescope (HTT) at the James Ax Observatory in the Chajnantor Science Reserve. See the full LBL article here . See the full Princeton article here .